From the kitchen of One Perfect Bite...I spent some time today perusing new cook books in our library. I found Emeril Lagasse's latest book, Farm to Fork: Cooking Local, Cooking Fresh and brought it home with me. I've not always been a fan of his, and it's only in the past few years that I've come to appreciate the work he does. I never doubted his ability as a chef or business man, but his antics as a showman made me uncomfortable and I tuned him out. Then, in the final episode of the first America's Next Food Network Star, I saw him perform an act of kindness that changed my mind about the man. When the winner was announced, everyone, save Emeril, swarmed around the couple who had won. The loser, who had obviously not been told what to do should she lose, just stood there, stunned, and unfortunately the cameras stayed trained on her. Emeril came to the aid of the visibly shaken young woman and gave her a squeeze, distracting her until she regained her composure. He was genuinely sympathetic and I became more interested in the man and his cooking after that. Who knew? The guy's a mensch. This wonderful version of limeade is in his new book and I can attest to how good it is. It's very easy to prepare and, while this version of the recipe contains no alcohol, this, mixed with white tequila, has the makings of a fabulous margarita. If you don't feel like cutting watermelon, the watermelon juice that's available in supermarkets will also work in this recipe. That juice, by the way, makes wonderful ice cubes, as well as popsicles for the kids. This is a lovely new take on classic limeade. I think you'll love this. Here's the recipe. 1) Place half of watermelon cubes in a blender and process until smooth. Strain through a fine-mesh sieve set over a large bowl; discard solids. Repeat with remaining watermelon cubes. You should end up with about 1 quart of watermelon juice. 2) Add lime juice and sugar to watermelon juice, and stir until sugar has dissolved. Taste, and add more sugar if necessary. Transfer limeade to a nonreactive pitcher and refrigerate until thoroughly chilled. 3) Serve over ice in tumblers, with lime slices for garnish. Yield: 5 cups. That sounds delicious - what a nice afternoon break it would make. Lovely story about Emeril - I can understand how that would help change your mind. Simply beautiful- what an inspiring recipe...and shot too! Thanks so much for sharing! I certainly plan to try it now that watermelons are in plenty at great price! This looks just lovely, and I do love limeade. Your fascinating stories that go with your recipes continue to amaze me! Yes, I watch The Next Food Network Star and Top Chef both. I love both shows and they are both on now. I have seen them all, but never noticed what Emeril did! You are one sharp cookie! I used to watch Emeril's show, but he had a band and a sidekick and it was so much like the Tonight Show! I half expected him to pull off a mask and become Johnny Carson! Now that I remember, Emeril had two shows. The food Network has a new channel now, the Cooking Channel, and we are getting that. Thank you for sharing that touching story about Emeril. I've also been a bit iffy about him over the years, but such an act of kindness is worth admiration. 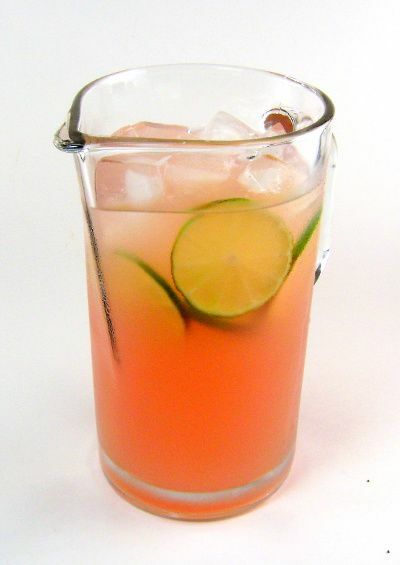 And of course, this watermelon limeade sounds so refreshing. You are always able to pair the best stories with your dishes/recipes. A lovely post! Sometimes, not very often people tend to surprise us with their unexpected behavior. Sometimes in a good way, like in this case, sometimes in a bad way. Human nature can be very surprising. The drink also looks very refreshing and I can give it to my kid as well. questa tua bevanda è molto-molto buona ! Che tempo fà nella tua città ? Emeril...sounds like a humble chef with personality. The watermelon limeade looks lovely. watermelon - cucumber is another nice combo. cheers! Deliciously beautiful!! Thank you for sharing your feelings about Emeril. I've dismissed him for years for the same reasons you gave. His new cookbook received a good review in the latest BookPage and I'm going to check it out. I certainly like the subject matter! Loved your story about Emeril; I have never heard of watermelon juice. Your jug looks so refreshing. Not only do watermelon and lime look so beautiful together, but I bet they taste really delicious together too! This is the perfect beverage for a summer day! I must be living under a rock since I have never heard of watermelon juice you can purchase. Whether store bought or homemade this would be a very refreshing summer drink. This is so refreshing! Have to get a watermelon tomorrow. Slurp! And thanks for writing back. Your grandson is getting really active soon, so it will be difficult to get his arm wrap up! Hope you're enjoying your day. I often wonder what it would be like to really know the people we see on TV. I suspect there would be many surprises in both directions. The drink sounds very refreshing. love that combination of fruit n veggie in the juice..very refreshing..looks wonderful, perfect for these hot summer days..have a nice weekend..tk care! This sounds great, and that was a nice glimpse into the more sensitive side of Emeril! I saw that on the Next Food Network Star also and thought that he really was a stand up guy! The Limeade looks so inviting and wonderful for a warm summer afternoon. I haven't bought a watermelon all summer, must do that immediately! Yummm.....what a great drink on such hot afternoons! Happy PS! What a refreshing drink! Thanks for the story on Emeril. That was a kind act that should be highlighted. This sounds so refreshing! We have watermelon and I can't think of a better way to finish it up! This is so simple yet so fresh and cool for summer. LOVE IT! We're growing our own watermelons, so this was perfect for me to give a try. And I love that you shared the story of Emeril and his merciful action. Please pour me a glass! Mmmm. Mary, this sounds absolutely delightful. I just finished cutting up a watermelon so I have all the ingredients I need to put it together. That was a lovely story about Emeril. I didn't watch last season, but I've really been into the current one. Yum sounds wonderful especially since our heat is coming back. Emeril's a mensch! Who knew? Love the story - was not a huge fan although he is credited for putting Food Network on the map! Farm to Fork definitely interests me. And I am so boring - I bring home watermelon and eat it. I once put it in a salad with feta - but mainly - I just eat it. Now drinking it is splendid! I've been seeing lots of recipes from this book, sounds like one I need, especially since he is nicer then I thought he was! Mary, I loved the story about Emeril. I did not watch season 1m but it says something about the man! As for watermelon limeade, it is a winner. Watermelons are everywhere now, and I love to buy them. This is another way to use them. Sounds wonderfully refreshing. Great story! I've been wanting to check out this cookbook. The limeade looks so refreshing for a hot summer day. Lovely combo, looks so refreshing.. This is one I'll have to take to work, and see what the boss thinks. We take a slushy like crushed ice version , non alcoholic, limeade to summer events. I'm going to try this and see what she thinks. Sound refreshing on the hot summer days we all seem to be having. This is a refreshing drink, just what we need, in the hot weather. I don't like eating watermelon but in a drink, I would love it. This sounds positively delicious...and very refreshing. I will definitely be trying this. Also, thanks for popping by my blog the other day. You mentioned that I should write movie reviews for a living. Interesting that you said that....my daughter and I have often thought of writing a classic movie guide. She actually writes reviews for an online movie review site. So, there is definitely some of that movie reviewer mindset in us. he is funny and now to know he is kind as well, thanks for sharing that story Mary. This combination sounds not only delicious but looks so pretty too! We have just finished eating an 8kg Watermelon! I must definitely remember this recipe for another time then. Thankyou so much for your recent visit to my blog and for your comments.